Camping may be roughing it to some people, but by bringing along a great cooler you won’t need to choose between enjoying the outdoors and enjoying a great meal. Instead of surviving on only shelf-stable ingredients, you can enjoy fresh foods and cold drinks during your trip next camping trip with a cooler in tow. But before you make the jump to loading your entire refrigerator’s worth of food into a cooler for the weekend, you want to be sure that your food supply won’t be left a warm and spoiled mess before dinnertime. That’s why getting the best cooler for camping is essential to making the most of your next trip, and why we’ve reviewed nine of our favorites to make finding the right cooler for you easy. Before we jump into the reviews, it’s important to get familiar with some of the features that can make or break a cooler – and that separate readily affordable coolers from their expensive, high-end cousins. The most important feature is the amount of insulation in the design, which translates directly to how long the cooler will keep your food cold and is the biggest factor in determining the cost of a cooler. If you’re planning for short weekends with easy access to a gas station where you can buy more ice, then a cheaper, lighter cooler with less insulation may be a money-saving choice. On the other hand, if you’re headed deep in the backcountry for days on end and need to keep highly perishable foods, like uncooked meat, cold, then it is likely worth springing for a well-insulated cooler. Durability and size are also important when deciding on a camping cooler. The material used in the lid hinges and the design of the spout can make big differences in the cooler’s lifespan. Plastic hinges and pull-off spouts are easily breakable and impossible to replace, whereas metal hinges and screw-in spouts are highly durable. In addition, many coolers are offered in multiple sizes and the choice depends on your expected needs. Again, this is a choice that may depend largely on whether you intend to use the cooler for short weekend trips, or for longer trips where insulated food space is at a premium. Size also determines the weight of the cooler, so it is best to choose the smallest cooler that will meet your needs to make it easier to transport. Orca’s cooler is the best insulated cooler on the market, period. This cooler can keep ice frozen for up to seven days, and when packed with food and ice can keep refrigerator temperatures for several weeks. 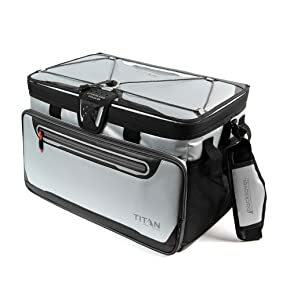 That makes this cooler the best choice for anyone looking to take extended trips into the backcountry, away from anywhere to restock the cooler with ice. It is also extremely well-built and durable, and will stand up to dry ice – which it can keep frozen for up to three days. Another plus is that the handles are very comfortable and the slightly narrow and tall design makes it easy to carry, although because of the cooler’s weight moving it when fully loaded will still require a second person. The only strike against the Orca cooler is its lid, which has a tendency to fall and snap closed without warning. However, when opened and closed intentionally the lid is very easy to latch using the rubber pull-tabs that lock it into place. And for those looking to add some style to their cooler, the Orca comes in a variety of colors and exterior designs. The Yeti Tundra is one of the most-loved camping coolers on the market, and one of the best for insulation. The Tundra keeps ice frozen for a week even in warm temperatures, and when loaded with pre-chilled food and ice can keep cold for up to several weeks. The cooler is also extremely durable, with an interlocking lid hinge that is almost impossible to break even after years of use and a sturdy exterior that won’t dent even when taking a beating. One of the best features of the Tundra is its rubber lid latches, which are extremely easy to open and close but are built solidly enough to render this cooler bear-proof. The only downsides to the Tundra are its carry handles. The handle hangs at the level of the drain plug, so that it needs to be held out of the way when draining the cooler, and the handles themselves are made of an uncomfortable ridged plastic that can leave your hands burning after a long carry. The Pelican Elite looks the part of a rugged camping cooler. 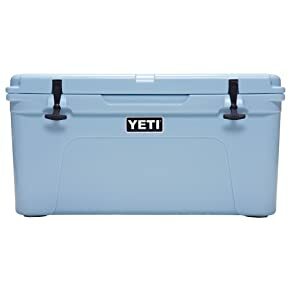 The exterior is entirely molded plastic, including the side handles that are built directly into the cooler frame rather than attached as rope pulls as for the Yeti Tundra. Although the Pelican is on the heavier end of coolers, this unique handle design actually makes it one of the easiest coolers to carry without rubbing your hands raw. Another great feature of the Pelican cooler is its latches, which use a simple push-button to release the lid and lock closed simply by closing the lid. The Pelican also doesn’t sacrifice on insulation to pack in these external ease-of-use features. Its cold retention matches that of the Yeti Tundra, keeping ice frozen for up to a week and keeping food and drinks cold for up to several weeks. 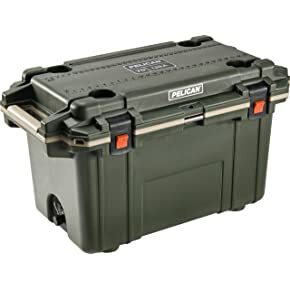 The only downside to the Pelican is the lid gasket, which isn’t as watertight as some of its competitors – when filled with water, the cooler can slosh water out of the lid. For fishermen looking to store a big catch, the Igloo Yukon is the ideal cooler. The cooler features an integrated fish ruler on the lid to measure your catch and uses an extra-large drainage plug that makes it easy to dump excess water without lifting the loaded cooler off the boat. Igloo also makes a tie-down kit, sold separately, that can be used to secure this cooler to your boat without taking up any extra space. Additional features, like bear-proof construction and a latch point to lock the lid, make this a great option for hunters and campers set up in bear country. 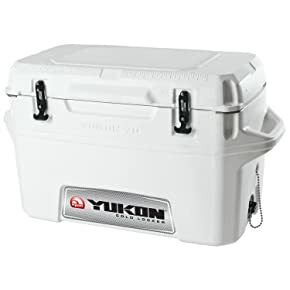 While the ice retention doesn’t quite match that of high-end Yeti coolers, the Yukon can hold its cold for up to five days with ice and takes advantage of an elevated floor design to reduce contact and heat transfer with the ground. The cooler is also durable enough to hold dry ice, which can push its cold retention closer to 10 days – plenty long for most recreationalists. 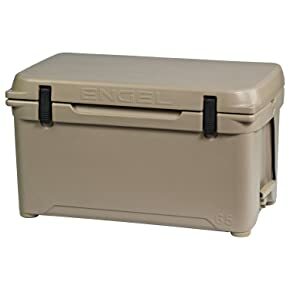 For those who need a mid-performance cooler that can pack a big load, the Engel cooler is a solid choice. This cooler can hold ice for up to five days and absolutely won’t leak water into your car, thanks to the well-designed lid gasket. For car campers who tend to stray from their campsite, this cooler is also certified as bear resistant by the Interagency Grizzly Bear Committee – a rating that speaks highly of the cooler’s durability and its ability to lock the lid securely in place using the rubber latches. The downside to this cooler is that in hot temperatures, the gasket can create a vacuum that makes the lid difficult to open unless you open the drain. The plastic molded handles are also relatively uncomfortable, which combined with the huge capacity and weight of this cooler can make it difficult to transport by hand. With those caveats in mind, though, this is an excellent cooler at a price strongly competitive to Orca and Yeti coolers. For a cooler you can take on any trip, from a mid-day picnic to a month-long road trip, ditch the hard-sided coolers for the Arctic Zone cooler. This soft-sided cooler is small, light, and extremely easy to carry anywhere thanks to the comfortable shoulder strap. It also offers features that hard-sided coolers lack, like an external zipper pocket for storing napkins and utensils and an integrated interior shelf that can prevent your drinks from crushing your sandwiches. The Arctic Zone cooler also uses a Velcro lid design, which makes it a cinch to open and close. However, this design can cause problems when trying to overstuff the cooler or even to place tall bottles rather than cans in the cooler, since even a little pressure pushing up on the lid from inside is enough to open the top and create a major leak in your insulation. 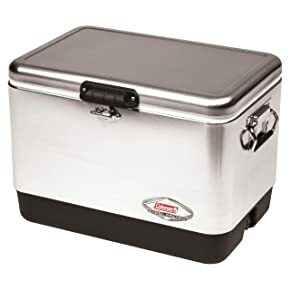 With the lid fully sealed, this cooler does a great job of keeping ice frozen for up to a full day in warm temperatures. You’ll turn heads when you roll into camp with this Coleman cooler – it’s sleek retro design is unlike any other cooler on the market. Featuring stainless steel components around the exterior, this cooler is not only stylish but also highly durable and resistant to the elements. It’s also extremely easy to open and close using the stainless steel latch, which allows you to open the cooler by pushing a lever and locks in place simply by closing the lid. While this Coleman won’t compete with high-end coolers on insulation, it does provide plenty of staying power for weekend warriors. The cooler can keep ice frozen for up to two days and will keep food and drinks cold for up to five. In addition, the Coleman is significantly lighter than more thoroughly insulated coolers, making it easier to transport between your house, car, and campsite. The handles, like the rest of the body, are metal rather than rope, which also makes this cooler easier to carry than some of its competitors. 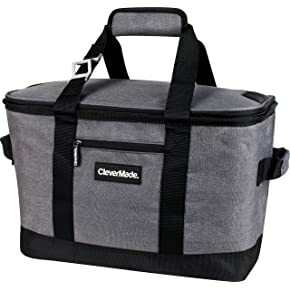 When you’re only headed out for a few hours and only need to keep lunch cold, the CleverMade cooler is the perfect solution. This stylish tote bag can keep ice frozen for up to a day and keeps food and drinks cold for two days or more. But beyond insulation, this tote offers a ton of features that set it apart from the pack. The best feature of all is this tote’s collapsible structure. When in use the tote has a firm structure and won’t flop over, meaning that you won’t be spilling ice and food out of the top. And once it’s empty, you can simply collapse the cooler down flat and store it easily in your car or even in a suitcase to travel with it. Carrying the tote is a snap, since it’s extremely lightweight and offers both duffel-style carry handles and side carry handles. The cooler also features a zippered pocket on the front and a slide-in pocket, enabling it to be used as a full-fledged tote bag. The finishing touch is an integrated bottle opener on the carry strap. The only complaint about this cooler is the lid zipper, which can break after several months of use if not treated gently. 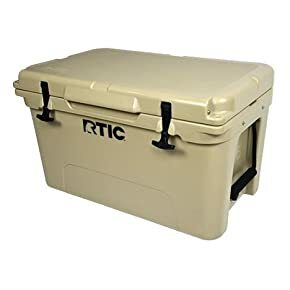 RTIC’s cooler is an all-around solid choice for any activity and is highly competitive to top-of-the-line Yeti and Pelican coolers at a much lower price point. But you’ll need to order soon in order to get one, since RTIC has stopped production after losing a lawsuit to Yeti over copyright infringement. The RTIC cooler will keep ice frozen for over a week at a time in warm temperatures and can keep contents refrigerator cold for up to three weeks when well-packed with ice. The 45-quart size is just small enough to be carried by a single person using the comfortable side handles, and the cooler is also available in 20- and 60-quart sizes. RTIC left the cooler without wheels in favor of increasing durability and its usefulness as a stable workbench, but that also means that the cooler can be more difficult to transport when it’s loaded full of ice and food. One unusual pitfall to this cooler is that RTIC’s quality control isn’t as amazing as their product – many customers report receiving defective coolers that leak water. However, they do offer a 30-day warranty with free shipping. All the coolers on this list are excellent, but there are certain brands that do a standout job of providing excellent coolers across their range of products. Brands you can trust, no matter what you intend to – or unexpectedly – use their product for or which specific cooler you choose. Foremost among these is Yeti. Their coolers are expensive, but that price reflects that they simply have the best lineup of products on the market. All of their coolers will hold ice for at least five days at a time and are virtually indestructible. That means that in exchange for the heavy front-end investment, you’ll never have to buy another cooler. 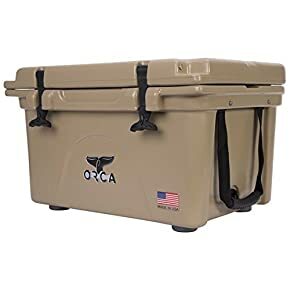 Orca may not have the same name recognition as Yeti when it comes to coolers, but their products are just as solid across the board. Orca coolers won’t let you down when you need to keep food and drinks cold, and they won’t fall apart even after years of beatings. On top of that, Orca prides itself as a company on its consistent support of charities and environmental causes. Pelican has been setting the industry standard for hard-sided cases for more than 40 years. And while they may be relatively new to making coolers, they’re already pushing the standard for what a cooler should be. Pelican is incorporating all the best features of their tried-and-true cases into their coolers, and adding insulation that can compete with Yeti and Orca coolers to keep ice frozen for nearly a full week. These coolers cover the range from lightweight totes perfect for a picnic lunch to heavy-duty iceboxes ready for weeks in the backcountry. While some may come with a high price tag, these coolers – especially those from Yeti, Orca, and Pelican – will last a lifetime of use and provide the best insulation available on the market. Get out there and enjoy some ice-cold food and drinks while enjoying the best that nature has to offer!